People and assets can be located programmatically. Estimote's invisible technology makes things happen magically in the right place and at the right time. Movements and interactions trigger digital events. These events can be captured and easily turned into relevant actions. Using data and software automation, a new frontier of real-world apps is possible. 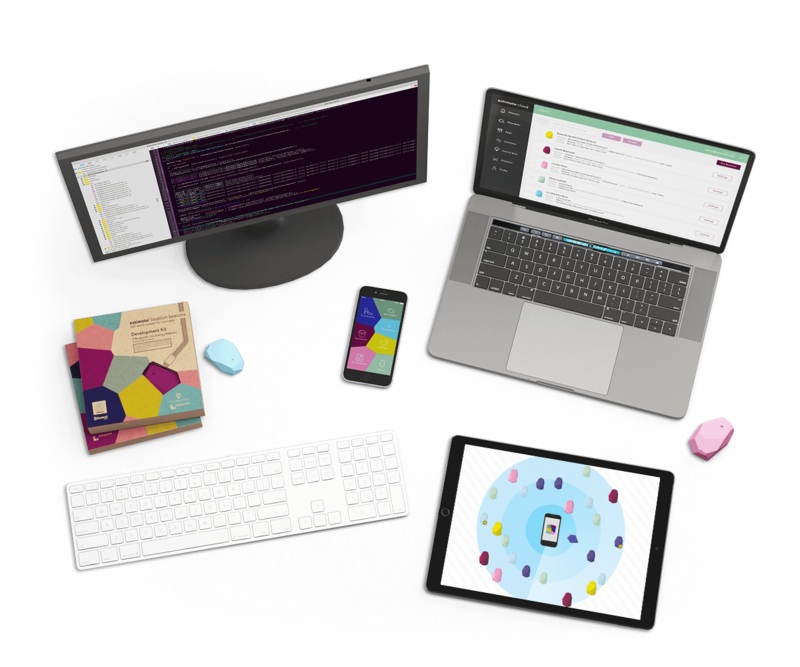 See other examples and the full Estimote Beacons SDK on our GitHub and Developer Docs pages. We're constantly improving and innovating our SDKs and our development team would love to hear your feedback. Apps designed for one location can easily be run in many others. Our easy-to-install location intelligence software can deliver personalized experiences at scale. Ubiquitous computing is here. Tiny inexpensive wireless computers are everywhere. They are in our pockets, or embedded into our surroundings and nearby objects. They talk to each other by sending ambient radio signals. 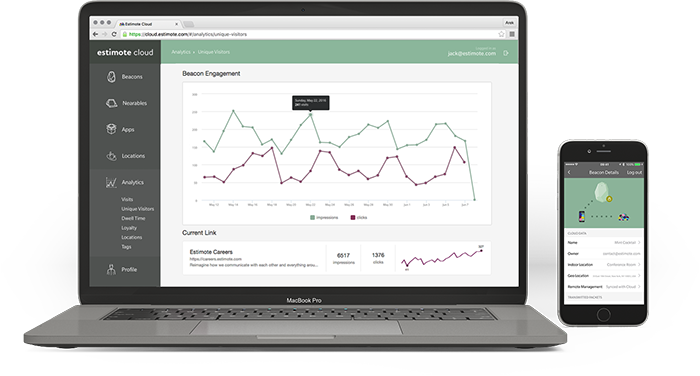 Estimote SDK can be embedded into mobile apps, which can then use signals from built-in sensors or nearby beacons to estimate the context and micro-location of an event. With our simple API, developers can easily build proximity or indoor location applications and trigger pre-programmed actions or send relevant messages. What are the most popular applications? Oh, there are many! The best are those that automate processes, remove friction, or deliver magical experiences. Many museums are transforming thanks to technology. They are adding interactivity and magic to the visitor experience. Estimote Beacons have helped the Guggenheim in New York to be at the forefront of this process. FC Barcelona is an icon. It is a symbol for locals in Catalonia and the best football team in the world for millions of fans across the globe. The club uses Estimote Beacons to transform the in-stadium experience for its guests. In fact, Estimote technology powers the largest and the most innovative commercial iBeacon deployments. Fortune 100 companies as well as startups and top agencies use our stack to build software for the physical world. Awesome technology! How can I get started? Join the community of more than 100,000 pioneers building apps for the physical world using iBeacons, Bluetooth beacons, mesh, and indoor location. To begin just get our Software Development Kit. You will be up and running with your demos and prototypes in minutes. You can also learn more on our Blog. Visit Developer Portal or browse the largest community forum related to Bluetooth sensors, iBeacon, Eddystone or indoor location. You can always Contact us to learn more. If you are done prototyping and plan to deploy your apps across hundreds of locations our SaaS subscription is right for you. We've built the features, applications, and RESTful APIs you'll need across your project life cycle. For smooth installation use our Deployment Tools to configure and deploy beacons in bulk. Once your beacons are installed use our Management RESTful API and Cloud Dashboard to monitor your fleet or update them remotely. Next, use our Analytics RESTful API to derive valuable location insights from your data or activate Infrastructure Sharing, our built-in provisioning system to securely share your beacon network with selected third-party apps. We have been working with sensor networks and low-power software since 2012. Our engineering team was the first to ship iBeacon-compatible beacons and our designers set the standard for the look and feel of Bluetooth beacons. We have successfully supported more than 60,000 customers globally, by helping them to prototype, deploy, or scale almost every type of proximity or indoor location application. Fortune 100 companies, the world's most creative agencies, as well as innovative startups choose our reliable and easy-to-develop stack. Our customers and our vibrant community of 100,000 developers love our products and our iterative approach to the Geo-IoT space. We run fast as a company. We adopt new technologies and ship innovations at an unprecedented pace. We are a full-stack team of 70+ passionate individuals in San Francisco, New York, and Krakow, Europe. We are committed to this space for the long haul. Our venture is supported by top Silicon Valley investors, who are helping us with our mission to create an operating system for the physical world. Copyright 2012-2019 © by Estimote, Inc., Bluetooth, Apple, Google and other trademarks are the property of their respective trademark holders.